Frigidaire FAQE7011KR Affinity, Classic Front-Loading Electric Dryer, 7.0 cu. ft. This electric dryer offers a wide selection of settings for each garment type. Equipped with the DrySense Technology, it claims to dry clothes more efficiently. The dryer has a wide range of program selection, including 7 dry cycles and 12 options with 5 temperature levels and 4 dryness stages. The 7.0 cubic feet Fits-More drum allows room for more clothes. It is made of painted rust-proof stainless steel, and equipped with the SilentDesign quiet operation system. The drum light automatically turns on and off with a swing of the door. The dryerís 7 cycles include Casual, Heavy, Towels/Beddings, Ultra Delicates and Normal. Its 12 options consist of the Auto Shrink Guard option, the Extended Tumble selection, and various temperature and dryness levels. The DrySense Technology allows faster drying of clothes without using excessive heat, while the Electronic Moisture Sensor adjusts temperature for more precise drying. A too hot dryer setting can result to over-dry, wrinkled and damaged garments. The unitís Express-Select controls consist of electronic knobs and buttons for easy program settings. It has 3 status indicators, which include a display that shows the cycleís estimated remaining time. The status lights mark the options and levels. Under the Express-Select panel is the 21î round door. It is made of translucent glass framed with a colored metal material. The door is reversible and can be hinged from either side of the dryerís entrance. The unit may be used as a freestanding appliance, installed side by side with a washer, built under the counter or inside a cabinet, or placed on top of the SpaceWise pedestal. 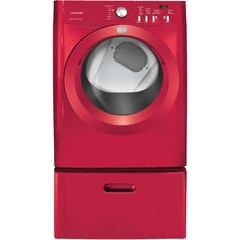 This dryer unit can also be stacked with a compatible washing machine. The 15î drawer pedestal and the stacking kit are sold separately. Available colors are Classic Red, Classic White and Classic Black. A fast, 25-minute cycle is incorporated among the dryerís 7 dry cycles. The user-friendly Express-Select control panel has remaining time indicator and status lights. Heat-sensitive items are dried with care by using the Air-Fluff cycle. For accessibility, this dryer is equipped with a large 21î round door. Steam helps eliminate odors and wrinkles on clothes, but this dryer is not programmed with one. Even though the dryer is built with the SilentDesign system, it tends to operate noisily. The dry rack is not included, but available with additional cost.